The trampoline was developed and patented in 1936 by George Nissen, a circus acrobat. The device became widely used during WWII by the United States and Royal Air forces to condition and train fighter pilots. Now, the octagonal toy is a common find in most backyards. Kids and adults alike love the springy actions that the trampoline allows. Who hasn’t played “Dead Man”, “Hot Potato”,” or “Crack the egg”? Trampolines can be fun but they can also cause a lot of injuries. Trampolines cause over 100,000 injuries a year. 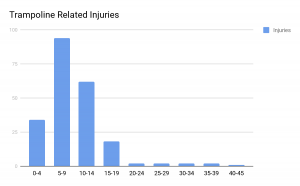 Most of those injuries are children aged 4 to 12. We want to highlight the dangers of trampolines while outlining a few ways you can still enjoy this backyard toy. In 1991 – 1992, Dr. Larson was the principal investigator on a study that took place in Logan, Utah. He wanted to understand what type injuries are sustained on a trampoline and what could be done to prevent these injuries. The original article was published in the Journal of Bone and Joint Surgery. The patients that took part in this study ranged from ages 18 months to 45 years, with the average patient being 10 years old. All but nine of the patients were younger than 20 years old. The most common month for injuries was July, which is also the time of peak outdoor usage. Kids are out of school in July with plenty of free time. The most common type of injury was a fracture in the elbow or forearm. Most people were injured while on the tramp (57%) vs. falling off the tramp (29%). The patients who were injured while on the tramp were an average of 11 years old, while those who fell from the trampoline were an average of 8 years old. Most injuries took place with an average of three participants on the trampoline at a time. Don’t play games that can launch people into the air, resulting in an unintentional dismount. We found a common game played by the younger participants was to have many jumpers on a trampoline and for each to try and bounce the others high into the air. This activity resulted in participants falling from the trampoline or landing on another jumper, resulting in injuries. Do not attempt stunts that are beyond your ability, especially somersaults. Instead, encourage kids to try one move at a time and always have a spotter. Avoid competitive trampolining at all costs. Take breaks if you are tired. 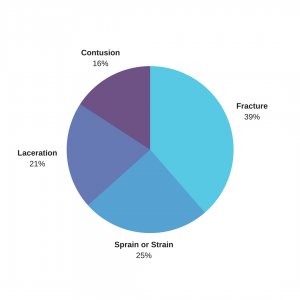 In a lot of the incidents we studied, fatigue increased the potential for injury. Only one person on the trampoline at a time. We recommend this since many injuries occurred with more than two or three people on the tramp at a time. This increases the likelihood for collision or other injuries. Place padding over the frame and springs. If the injury didn’t occur when colliding with another participant, the injury likely happened because of the hard metal frame. Metal and bones just don’t mix. Children under 6 should never jump on trampolines. Their bones are still growing, making them more prone to injuries. 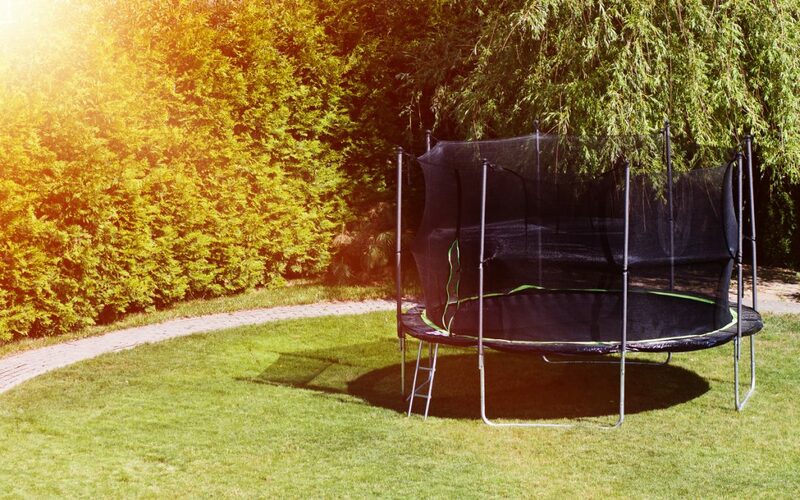 Make sure to take these safety precautions on your backyard trampolines this summer.